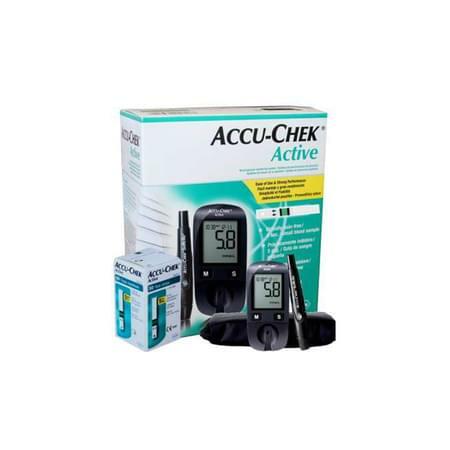 Accu-Chek Active kit contains:- Meter, Test Strips (10), Accu-Chek Softclix lancing device with 10 lancets, Carry case, user manual, User manual, Quick start guide. Easy-to-learn and easy-to-use: with intuitive icons and simple two-button navigation. The large display and numbers make it a smart choice. Accurate and fast results: The meter requires less than 5 seconds to measure and delivers blood glucose level and deliver results that correlate with a lab test. Integrated data analysis: From the results stored in memory your meter can average your blood glucose results for the last 7, 14 or 30 days. Auto-coding: by simply inserting a code chip. Under-dose detection signals when there is not enough blood on the test strip. Product will not be returned if the seal is broken. For warranty-related claims, please contact the brand service centre.